I could read 100 novels in row from Anna Bradley's pen. And enjoy of all them with a very high probability. This novel is heart-wrenching, and I'm not really talking about the protagonists' difficult relationship, but about Charlotte's need to blame and punish herself for her husband's death. The part of the novel settled at Hadley House is certainly the most well written in the story, it is particularly poignant, the feeling of bleakness and anguish in that place is something I strongly felt. 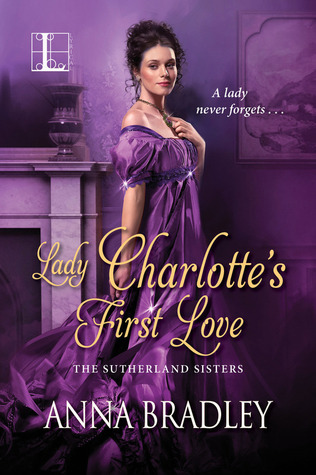 I also found the way Charlotte is depicted in this part, as particularly interesting within the world historical romances, she behaves and respond (and thinks) in a way that almost makes the reader believe she got mad; which is crucial if you want to make credible the way she acts...but can also be a dangerous decision. The author worked it out perfectly. There is only one aspect that didn't convinced me as much, and this is the ending or more specifically the pregnancy, when Julian finds out about their concealed, unborn child. Well, the way I see it, the fact could have been developed in two ways: he decides to forgive her immediately, or he needs time to make peace with what happened. The novel follows the second option, which is great if you ask me. However, in this case, more plot is generally needed; and here in my opinion it was too rushed. Moreover, and this is a question I started asking myself in Lady Eleanor's Seventh Suitor, why did Charlotte hide her pregnancy? I'm aware of all the historical difficulties, and I can also understand that a young woman could be scared, and I would have understood all of it if Julian had decided to leave for the army before she had found out, but I honestly do not find particularly believable that the way Julian behaved in the previous novel, although wrong, is sufficient to justify Charlotte's decision to marry another when Julian had also demonstrate his deep feelings for her and his intention to be honourable. Of course in this instance we would have not have this novel the way it is but let's say that I would have avoided the pregnancy entirely. Nevertheless these types of storyline give me great pleasure, and Anna Bradley is a highly skilled author, and I loved Charlotte especially I adored Julian from the beginning.